Harold Balazs’ impact on Spokane cannot be overestimated. In Seattle, his art can be found at the Henry M. Jackson Federal Building and the entrance to the King County Administration Building. Harold Balazs, the celebrated Spokane artist whose large-scale sculptures dot public and private spaces throughout the Inland Northwest and beyond, died Saturday night at his Mead home, surrounded by his family. Blair Williams, whose Art Spirit Gallery in Coeur d’Alene has represented Balazs for 20 years, confirmed the news Sunday. Mr. Balazs’ impact on Spokane cannot be overestimated. Among his public works are the Rotary Fountain at Riverfront Park (made with Bob Perron in 2005), the 1978 Centennial Sculpture floating in the Spokane River near the convention center, and The Lantern on the river side of INB Performing Arts Center. 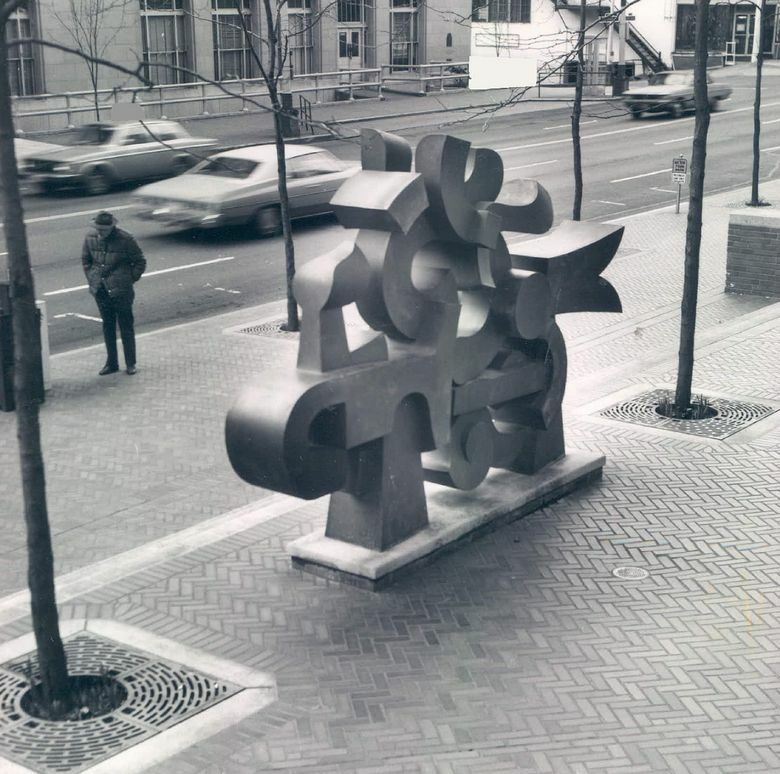 In Seattle, Mr. Balazs’ works include the dramatic metal sculpture near the entrance to the Henry M. Jackson Federal Building at 915 Second Ave., commissioned in 1976 for the federal General Services Administration. Untitled, the work, resembling a flying heap of machine parts, is made from sheet copper, and rests on a base of brick and concrete. 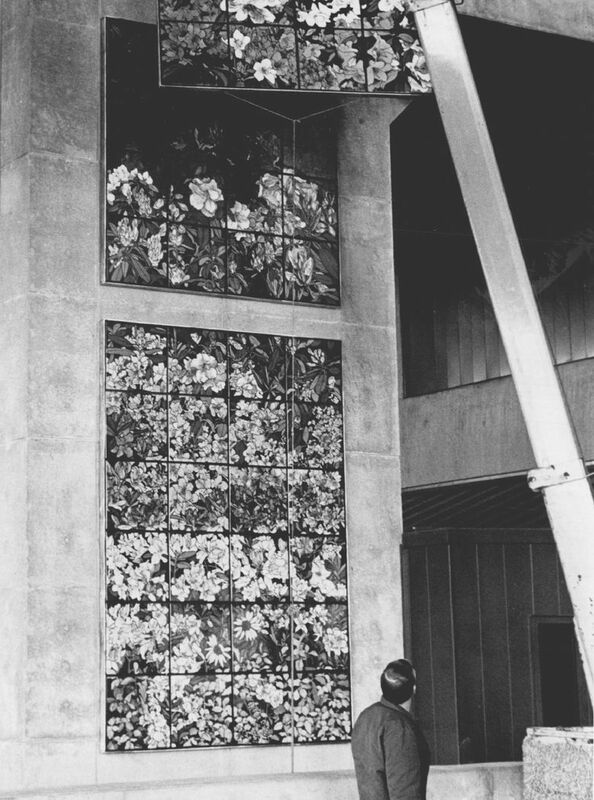 His work of enameled steel panels, “Rhododendrons,” was at the Kingdome before its demolition, and today graces the Fourth Avenue facade of the entrance to the King County Administration Building. He has pieces on display in Cincinnati, and closer to home at the University of Idaho in Moscow and North Idaho College in Coeur d’Alene. “Listen,” a large abstract work meant to evoke an ear, was commissioned for Spokane Public Radio’s new station on North Monroe Street, while Untitled, originally installed at River Park Square, has taken a prominent place in the newly redesigned Chronicle Courtyard behind The Spokesman-Review on Sprague Avenue. After his family moved to Spokane in the 1940s, he enrolled at Washington State College and earned a fine-arts degree. He graduated in 1951 and started selling enameled jewelry in Spokane. By then he was already a husband and father. He and his wife, Rosemary, had met while he was a student at Washington State; his parents lived nearby. They married in September 1950 and moved to a “$12-a-month shack” in Pullman, he said in 2016. Rosemary got a job at a bank and served as his art assistant. Their son, Kurt, was born shortly after graduation. Soon his work attracted the attention of local architects who embraced a midcentury modern aesthetic starting in the 1950s, and they began incorporating his work in their designs. In a 2016 interview with The Spokesman-Review, Mr. Balazs said he started selling work while still in college. Twins Erica and Andrea were born in 1959, and the family relocated to their 7 acres on Peone Creek near Mead, where Mr. Balazs set up shop. That workshop was famously messy. It also was the kind of place that drew young artists who happily took up Mr. Balazs on the offer to come out and make stuff. “If he liked stuff a young artist was doing, he would invite him up to his studio to work with him. That’s how he became known as ‘Uncle Harold,’ ” said Sue Bradley, a longtime friend and gallery owner. “He had the ability to make you smarter, more creative, a better version of yourself. “Harold was such a decent human being, so generous in giving,” she added. While best-known for his large sculptures, Mr. Balazs was prolific in a number of genres. The Lincoln Building in downtown Spokane is home to two large enamels, “Birds of the Northwest” and “Northwest Wildflowers.” Some pen-and-ink drawings were gathered in a limited-edition book, “The Family Album,” in 2015. He also created pieces for dozens of churches, including a large concrete sculpture at Messiah Lutheran Church and metal pieces for St. Mark’s Lutheran Church. At Spokane’s modernist gem, St. Charles Catholic Church, Mr. Balazs’ fingerprints are everywhere, from the 17-foot-tall welded black metal sculpture of St. Charles Borromeo on the building’s facade to the 12 enamel panels on the entry doors that tell the story of Jesus’ life. He leaves a body of work on paper that includes charcoal, acrylics, watercolors and ink. In January, the Art Spirit Gallery in Coeur d’Alene will open its long-planned Balazs exhibit, “I Did It My Way,” which will include new paintings. Mr. Balazs, he said, learned from his father, a metalworker, an appreciation for a well-made thing. That craftsmanship, combined with genuine emotion, results in works that have impact. 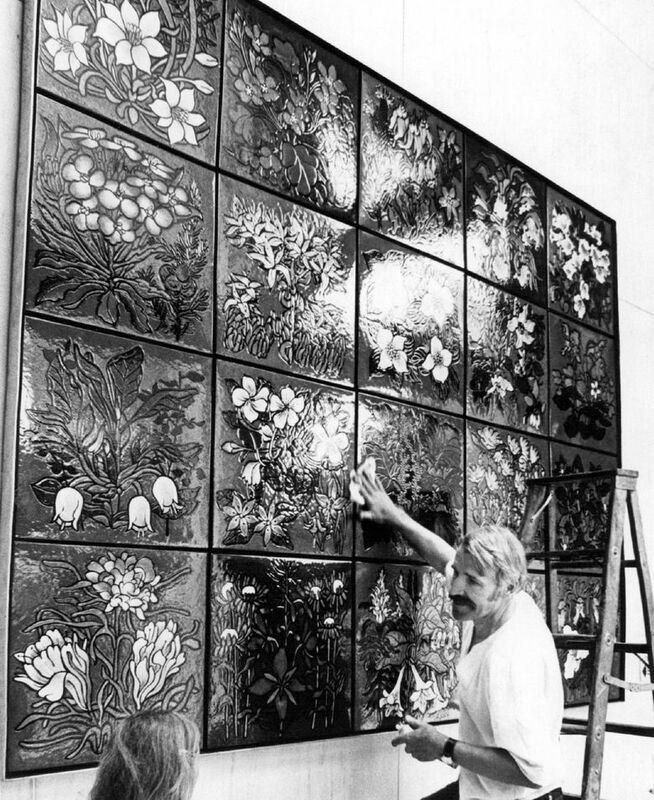 “His work was always approachable and accessible because it was suffused with joy, with discovery, with invention and without any whiff of artifice, the ‘market’ or posturing,” Mitchell said. Mr. Balazs is survived by his wife and their three children.